Extremely sleek 1/4" Patch Panel with grounding possibility offering 2 rows of balanced sockets, a total of 24 front pairs and 24 rear pairs fully PCB-wired (without nut fastening), 1U 19" rack-mount and identification strips for front and rear panel included. 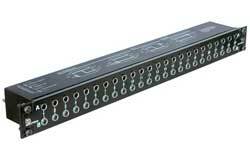 The Neutrik Rean NYS-SPP-L1-USA is a economical and remarkable sleek designed 1/4" modular Patch Panel for 19" rack mount (19" x 1U) with a reinforced metal housing. 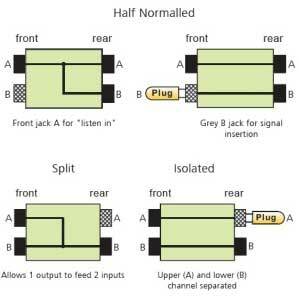 Each of its 48 PCB wired balanced channels (24 front pairs and corresponding 24 rear pairs) can either be grounded separately or in groups of inividually chooseable channel numbers (detailed information see below). The PCBs are held securely in place by being clamped between the front and the rear panel, this grants an easy reconfiguration of the Patch Panel without the danger of loosing any small parts (e.g. nuts). The grey jack serves as an easy and distinguishable normalling identification.